Kim Kardashian’s Engagement Ring From Kanye West – Wow! We’re like most people: We love to hear the latest about Kim and Kanye. Kim Kardashian’s engagement ring is glamorous, just like she is. Designed by Lorraine Schwartz, it features a spectacular center diamond that’s at least ten carats. Kim and Kanye enjoy attending sporting events together, so it’s fitting that he proposed to her with the help of the jumbotron at San Francisco’s AT&T Park. Like many men do, Kanye took a leading role in designing Kim Kardashian’s engagement ring. As he told jeweler Lorraine Schwartz, he wanted the flawless cushion-cut diamond to appear as if it were floating on air. 15-carat diamonds are difficult to come by. Get the look of Kim Kardashian’s engagement ring without breaking the bank by choosing a halo ring with a very slender band embellished with pave diamonds. The halo diamonds surrounding the center stone contribute to the floating look and create the illusion of a much larger center stone. Born October 21, 1980, Kim Kardashian is one of America’s favorite reality stars. In 2010, Kim was named the highest paid reality TV personality ever, earning approximately six million. Kim’s entertainment career isn’t the only thing we love to watch. As a reality star, everything about her life is highly publicized. Her previous marriage to basketball player Kris Humphries ended in divorce just 72 days later. The long, drawn-out divorce proceedings finally ended in June of 2013, the same month that Kim gave birth to a daughter, North, whom she shares with new husband Kanye West. Kim and Kanye celebrated their marriage in May of 2014. Kim’s style sense is famous, too. She, along with sisters Khloe and Kourtney, are highly involved in the fashion industry, having launched exclusive clothing collections, fragrances, and a book, Kardashian Konfidential.Did you know that Kim Kardashian is one of the celebrities represented at the New York City branch of Madame Tussauds Wax Museum? The figure was unveiled on July 1, 2010, and is a favorite with visitors. What Our Experts Have to Say about Kim Kardashian’s Engagement Ring. When it comes to celebrity engagement rings, Kim Kardashian’s is among the most talked about, maybe because of Kanye’s highly publicized proposal, and perhaps because Kim and Kanye spend plenty of time in the spotlight. Although the couple haven’t shared details about the price tag, the ring appears to be worth four to five million dollars. A representative for Lorraine Schwartz told E! 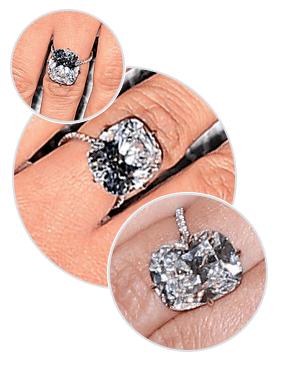 Entertainment that the ring is made with non-conflict diamonds and is D-flawless. “It’s the best color, clarity, and cut there is. There’s no comparison!” he said. Celebrity jewelry is almost always incredible, but despite the sky-high cost of celebrity engagement rings, it is entirely possible for the rest of us to find similar, but much more affordable engagement rings from Brilliance. Whether you chose from our many popular designs or decide to create a Hollywood engagement ring all your own, you’re sure to love the way our designers take inspiration from celebrity engagement rings to create the perfect match for your vision and lifestyle.